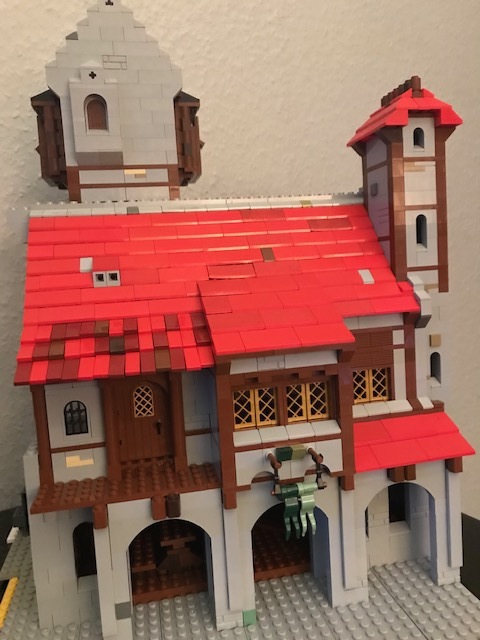 The guards house is nearly finished. The roof is a little bit strange, but at least it is some kind of leak proof. Lots of details are still missing. The roof ridge isn't done, the chimney to the right needs to be bricked up and the balustrade is missing also. Most important: the Avalonian Colours swell in the wind! 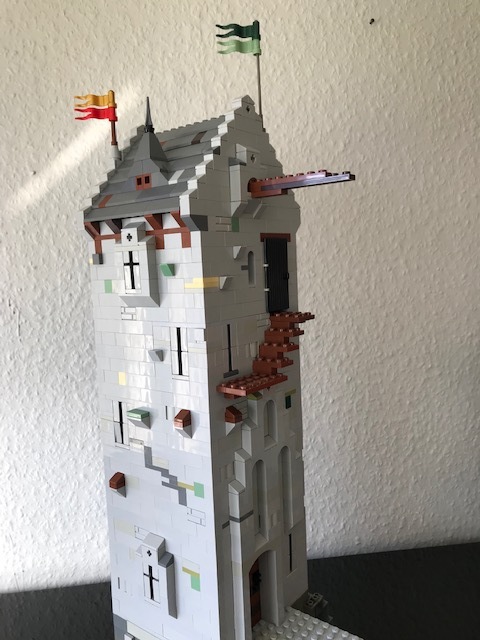 I just attached the pallas module - the Bergfried is missing. While the tower itself stays the same (at the moment), the Donkey made some changes to the guards house roof - hope it looks better now. The small tower is to clean, but this can be changed easily. Can somebody give me a hint how to make proper pics? Not to talk about the hardware (I have a SLR), but about lighting, background - and the space needed of course. For smaller photos I use a soft light box. For bigger ones I have a vinly background setup. I use natural lighting mixed with lamps. Don't put the lighting of the lamps directly on your creation cause the reflection will harm the results in most cases. After that I usually edit them in photoshop. I hope you understand my english lol. 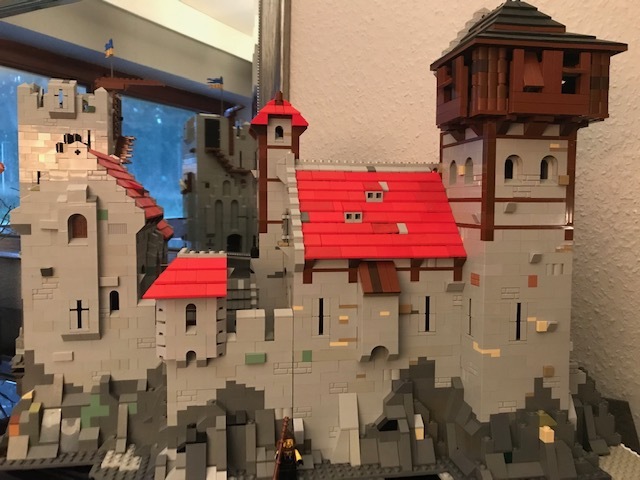 I fear my biggest problem will be the sheer size of the castle when finished. Presently the 3 modules take 55x60 cm, so at the end I can expect to use 1 square meter in minimum. While i have lots of available space, it will still be a problem to find a place where a proper ground & back ground can be installed. We will see. P.S. and the tower top WILL be changed - it's ugly. Spent some 13 hours today, driving from Dortmund to Munich and back. Time enough to rethink the design of the upper floor, and came out with a few nice ideas. I will try out tomorrow and show the result (if it is not to ugly). Yeah I do also find the best Ideas for my MOCs when I'm doing something else like sleeping, jogging or driving in the car. Keep up that great work! The Donkey is just al little bit...distressed. 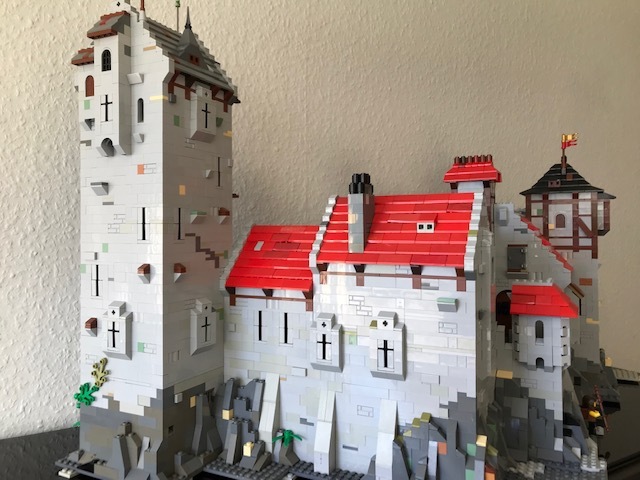 In my childhood days I loved the LEGO castle sets, and i owned quite a bunch of them. Lateron I can remember I bought some, just to collect them. 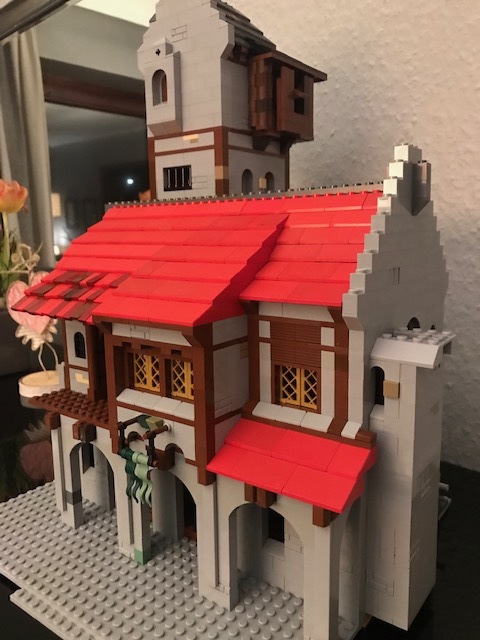 Those Sets - and of course the figs - stayed "at home" when I left Berlin, 25 years ago now, and when I planned to visit my parents this week, I decided to look after them. 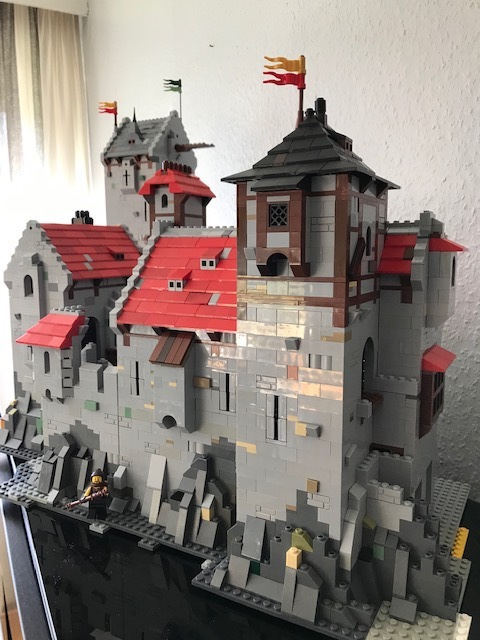 I expected to find some 30-40 figs, and also some bricks I could use for my castle. I arrived this evening, coming from Munich, but what I found I would have never expected - not in my wildest dreams. 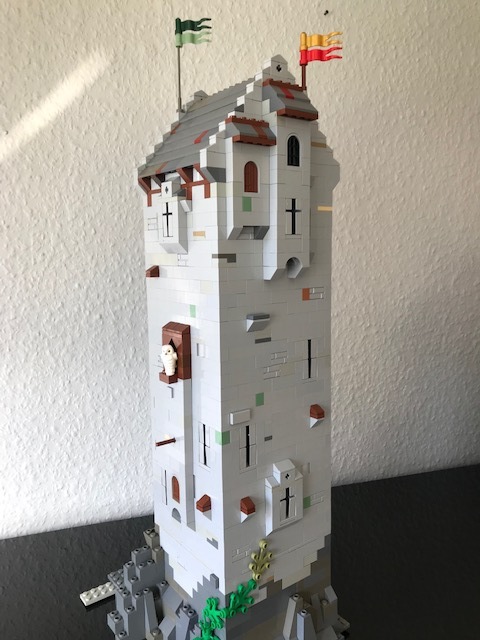 Stored in 7 boxes - and nicely decorated with cobwebs from 2 decades - I discovered some 2 dozens sets at least, mainly from the classic era of castle sets. Beginning with 383 and 677, and ending somewhere in the late nineties. I found carts and boats and ships and buildings, including 6080, 6067, 6074, 6062, 6085, 6077, 6075 and 6086 - and many more. And I found minifigs. 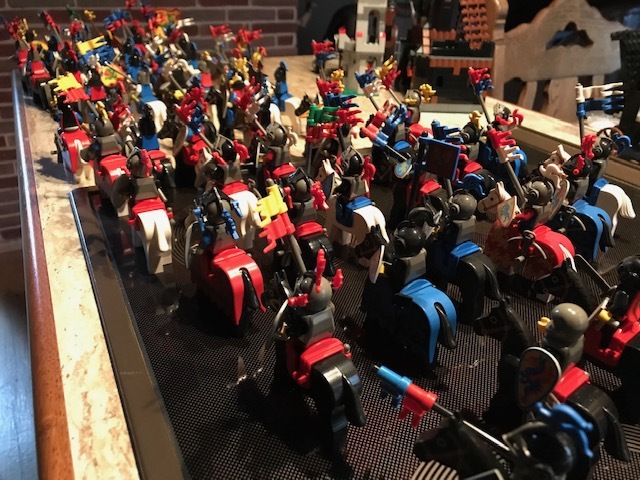 One box contained 63 mounted knights and additional 73 knights and soldiers, including 11 wolfpack men. Another box I did not examined in detail seems to contain at least another 80-90 soldiers, including in minimum 20 forest men. 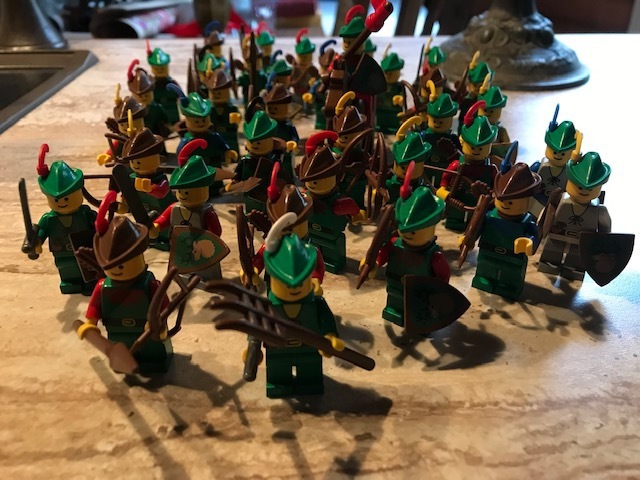 In total just the figs should amount to at least 200-250, and there are weapons and equipment for another 100. I even found some sealed sets - 7187 (which is not as old as the rest), one battlepack 4527427 and a polybag equipment set 5059B. And what the hell is this???!!! Christ on a crocodile, what a treasure find! Congrats! So what to do? For sure I will keep the Wolfpacks and Forest men, as well as a strong cavalry unit of some 30 knights. Also the vassals and the maidens. And the rest? 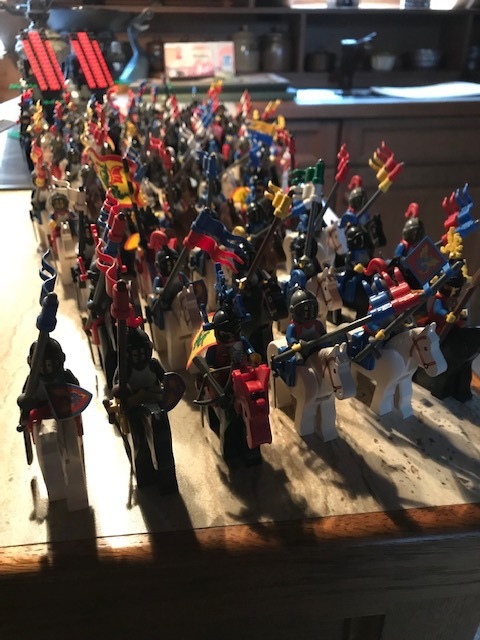 I don’t know, but I think I could try to sell most of them via BrickLink. At least I could try. 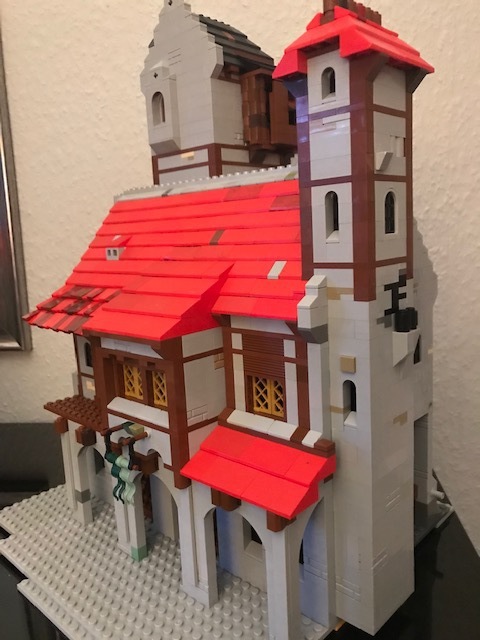 Great progress, and fantastic news about the old sets and minifigures! This thread is so enjoyable on many levels. Thanks for sharing all of this with us! I'm happy You like it. To my pleasure I found also those figs from 383, so both knights are mine too unfortunately the red visor is broken underneath the sight - not a big problem, but still a flaw, and from the red-and-tan shield of the black knight i scratched of the colour when I was a kid...I remember i had been sorry from the very moment I misused it that way. Perhaps I can find a substitution somewhere. 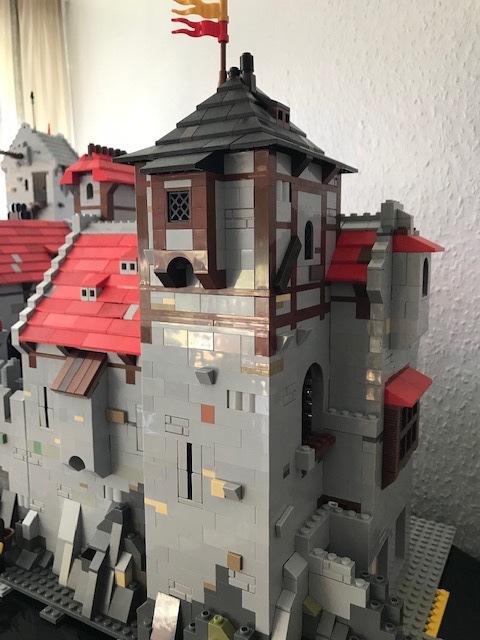 I have been busy all the week, but today I will start to rework the roof of the big tower as well as that from the smaller one, and after that I will make a start with the peasants gate. This question would be better asked over in the Guilds, where I would see it more easily. One build (for example a castle) could contain many of the different settlement categories. For example, you probably have most of the military categories out of the way. You'll have the hospitality categories, too, with a kitchen and dining hall, as well as dormitories. 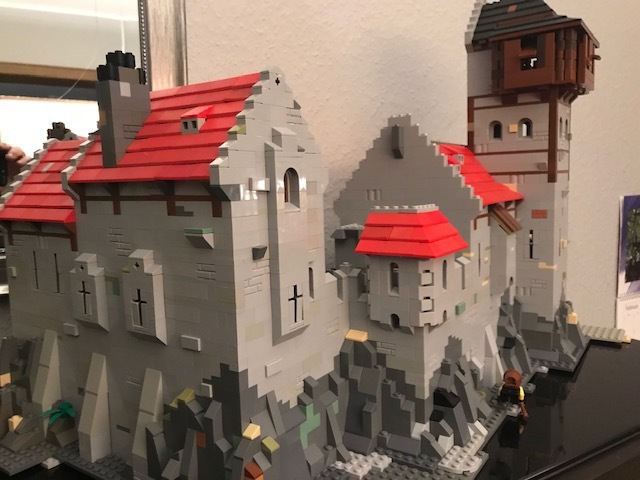 If there are laborers about, and craftsmen doing crafts, with small shops inside the castle (like the blacksmith) that takes care of those categories. Agriculture could be filled with a storehouse for grain, or something like that, or a small farm outside the castle walls. So, yes, they can be part of a bigger building. Thanks for the answer Mylord, and yes, it would have been better to ask this within the Guilds section, sorry. Also, don't sell the figures unless you're desperate for the money. You can keep them, it's not like they eat your bread, and you may find them useful later on, or maybe your children would love them. And if you'll find out that you really don't need them - now it's too soon, I guess, you just washed them of dust - BL will be there for you 24/7/365. 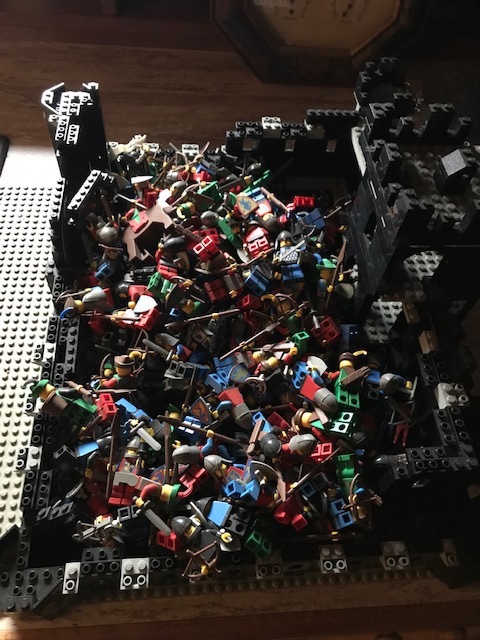 It will take some time to clean all the bricks and sort them, and until thats finished my plastic buddies are safe. Lateron we will see. I made a quick update. 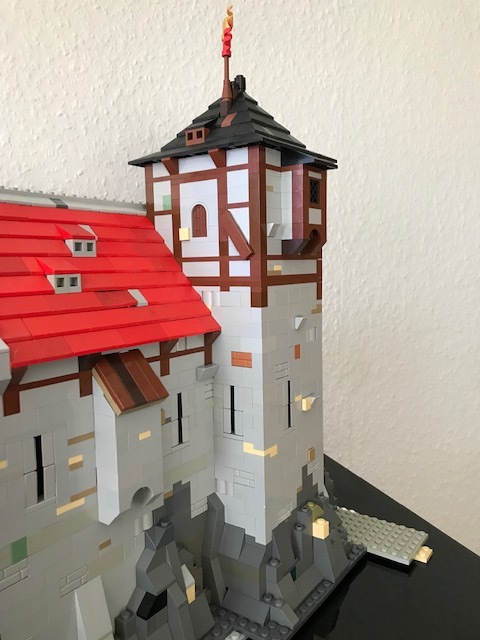 First I reworked the roof section of the big tower - with 48cm presently "big" should be ok - and in my opinion it looks better now, more realistic than before. 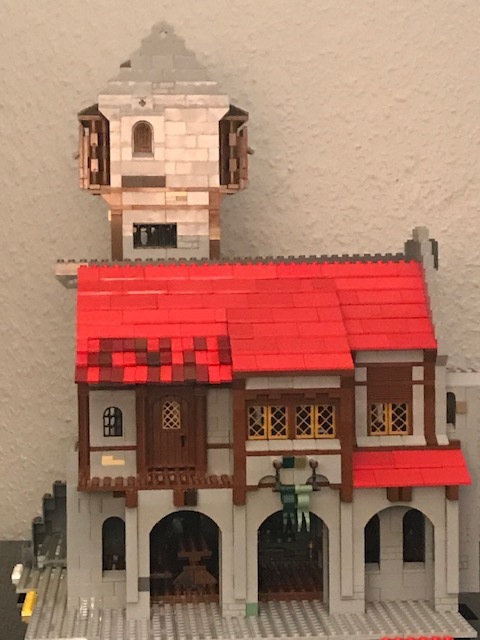 Although big enough, I'm planning to rename it to "Owl Tower" for some reasons. Please notice the colours shown are the double-green ones for Avalonia and the gold-red ones of the Marcher Lord who is the principal of the castle itself. Next I had to change the look of the guards house tower, which had been a total mess before. It's now smaller and should fit better to the rest of the arrangement. In addition I closed the pediment. The archway will lead to the battlement above peasants gate, and the panels on the ground will be covered by some small building - don't have an idea how it will look like. So lets have a look at the total site presently. The ground covered at the moment is some 30% of the total ground the castle will take in the end. 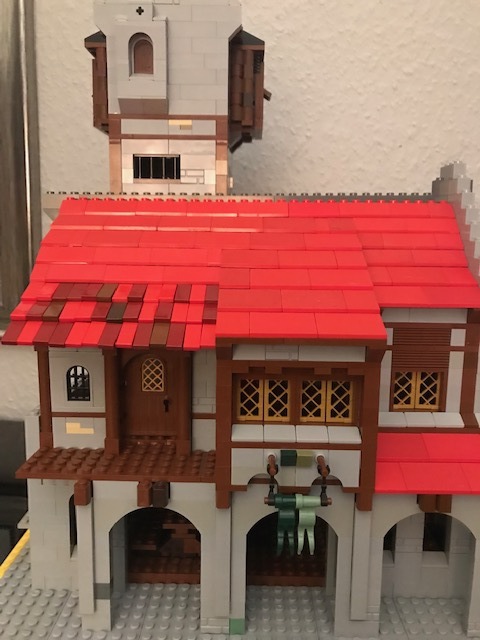 There are still lots of changes I have to do: the roof of the small turret facing to guards square needs a redesign, as well as the oriel on the battlemet between the old palas and guards house. The old palas itself needs changes AND it's interior. The smithy on base floor will be replaced by additional space for arms storage, and a new, dedicated smithy will be established somewhere within the castle. 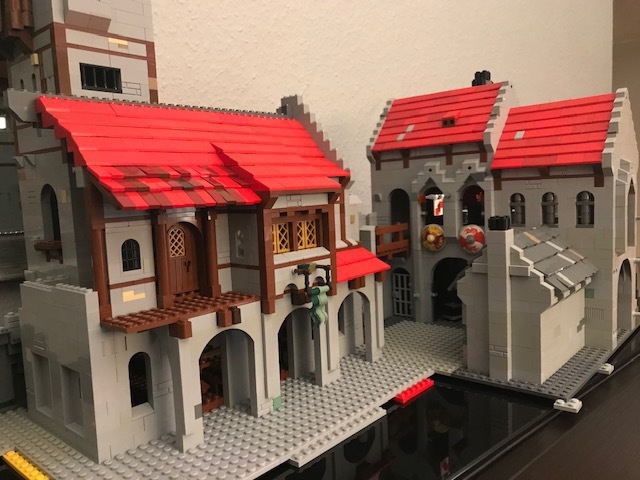 I had planned to continue with the peasants gate, but I can also imagine to continue with the main gate, right next to the Owl Tower. Keep You informed. That rebuild tower look great, riminds me of combination of the towers from Radoch/Owl Castle. Both are beautiful creations with the highest level of realism - both could be real castles indeed. 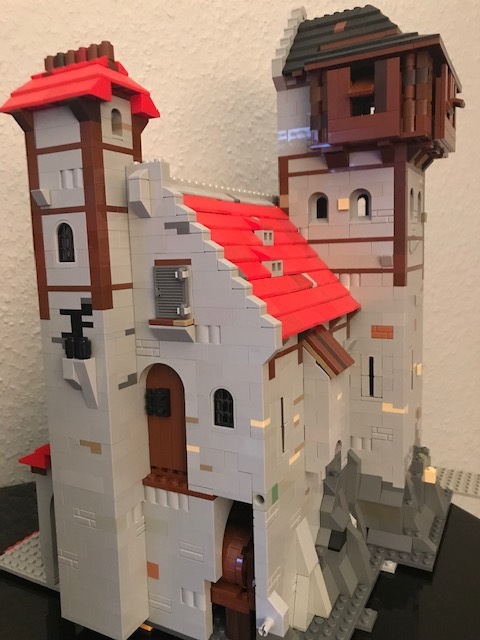 I'm not going to compete with, but I would be happy if this castle of mine would look half as good as those two. I think for someone calling himself a (total) noob you are doing very well and your creation can go on par with those. 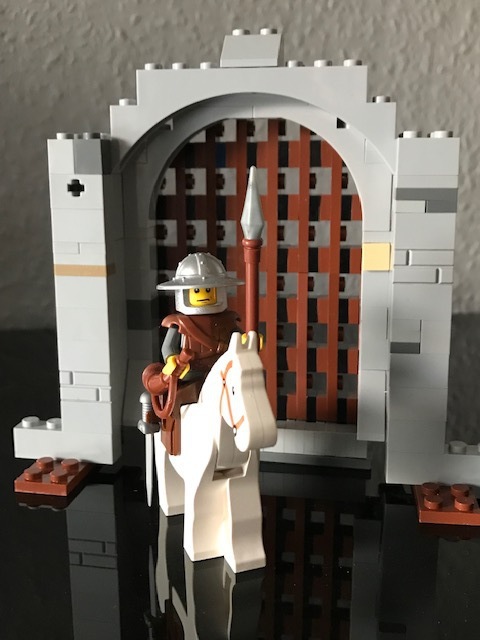 In the caste I'm currently working on I went for an old style "6080 King's Castle" portcullis with some new elements. 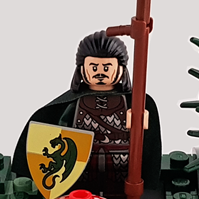 The Portcullis is quite brick-demanding. The design has been "borrowed" by JesperAllens "Seawatch Keep". 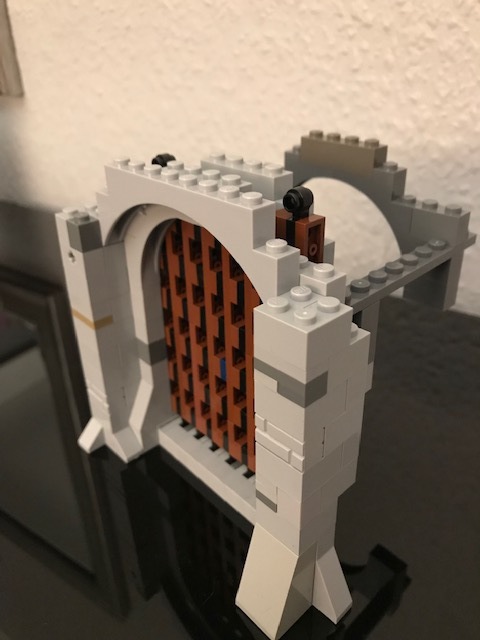 To fit into the archway, the whole construction has to be jumpered, including the wooden gate that will be placed behind. I'm not quite sure how this will work, but I'm confident it will do in the end. 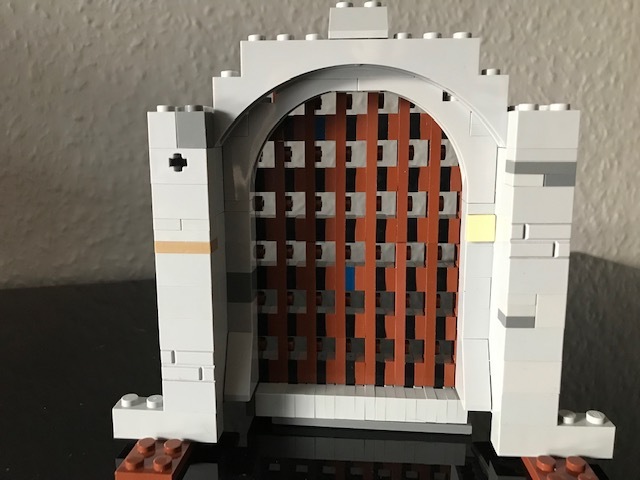 The portcullis itself still lacks black 1x1 tiles within the gaps, but as I had to realize, I'm quite short of them, so I first will have to order. Here we have the frame structure of the main gate. 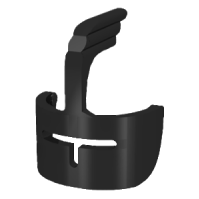 The backmost arch will guide the wooden gate, the two grommets will take the cable winch. Astonishingly the grating can be moved easily. 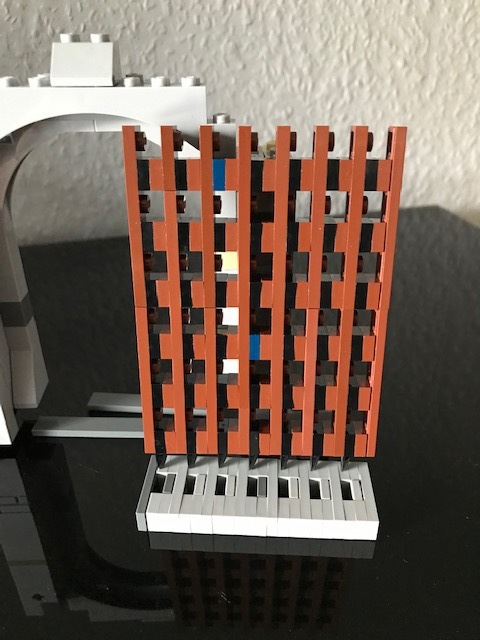 I like your clean building style. no over the top fancy building techniques (nothing against them but i prefer this ). 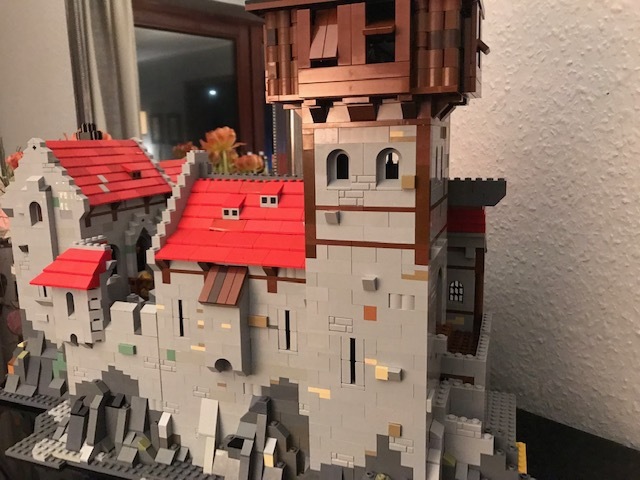 The last picture of your full castle (16.02.19) gives this great feeling of cramped buildings and towers "behind" high walls with the Owl-Tower (cute little Owl ) towering over all! Just nice and fun to watch. And i agree, you can stop calling yourself a noob! Maybe apprentice? 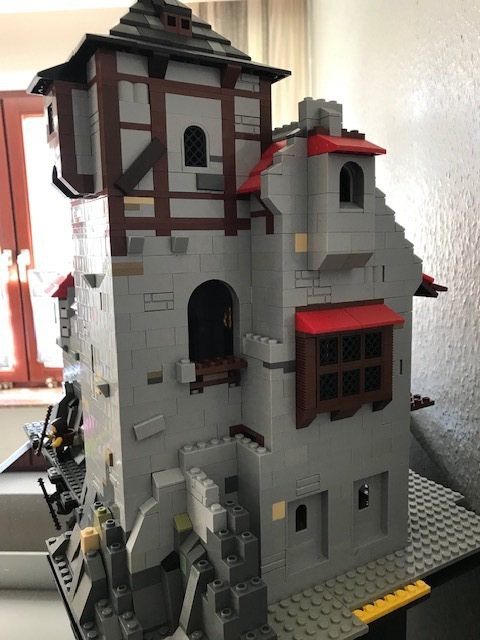 The contest also hinders me to continue with the castle - I am old and can only concentrate on one task at once. I'm still young (30) and have so many projects going at the same time, non of them are getting finished. Looking forward to more of your builds though.